The French Rugby Federation (FFR) has announced plans to build a new 82,000-seater stadium in the Paris suburbs at an estimated cost of €600m (£484m). The stadium, that will be situated in Evry Centre-Essonne, 25km south of Paris, will replace the Stade de France as the side's home ground and is set to be completed in 2017. The hi-tech facility, currently the site of a disused racecourse, will feature a retractable roof and removable pitch with the development also set hotels and shops. The decision to initiate a move away from what has been their playing base for the last 14 years was prompted by the FFR's growing frustration at the constraints of the Stade de France where they must pay a reported €5m (£4m) per game in rental charges and also schedule matches around France's football fixtures and concerts that take precedence. As a result, it is understood that the FFR make only €2m (£1.6m) for each 82,000 sell out while in comparison the Rugby Football Union bank a reported €6m (£4.8m) after each Twickenham clash. Reflecting on the decision to opt for the Evry site ahead of that of Thiais-Orly, situated close to Paris' Orly Airport, FFR president Pierre Camou said: "It conforms to what we want. One of the most modern stadiums in the world: pitch, roof, multi-functional, with exceptional comfort levels for spectators." Serge Blanco, who led the stadium project, said: "This Ris-Orangis site opens new horizons for our game in France. 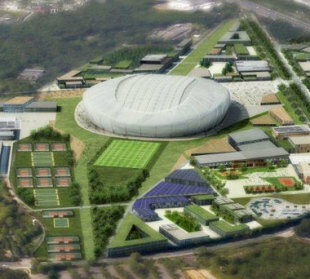 It will provide a new-generation stadium that will become a showcase for French rugby." France's National Centre of Rugby and the FFR headquarters will remain at Marcoussis 20km west of Evry.